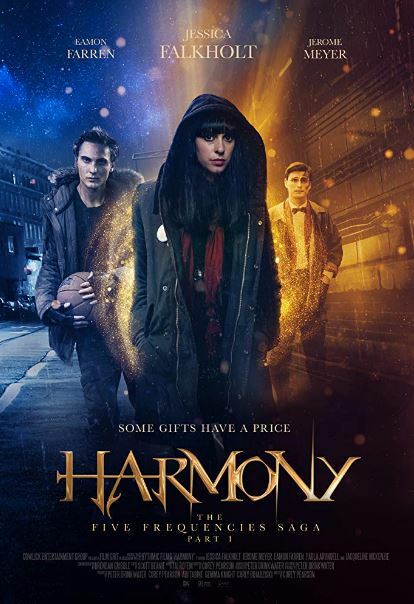 Harmony (Jessica Falkholt) is a homeless 21 year-old who possesses the ability to absorb the fear of other people. When she is drawn into both the life of a troubled young man (Jerome Meyer) and the activities of a violent street gang, she must learn to master her powers to face the greater challenge to come. The existence of any Australian-made fantasy film gives me joy. As a filmmaking nation we punch above our weight when it comes to drama and comedies, and we’re rich with talent on both sides of the screen. While we do produce some great horror films, thrillers, and so on, I am struggling to remember the last time a production team took a punt on a teen-oriented romantic fantasy. Hollywood has the likes of The Hunger Games and Twilight, and now Australia gets Corey Pearson’s ambitious debut Harmony. Make that Harmony: The Five Frequencies Saga Part I. There is a peculiar level of hubris that comes with including “Part I” in your debut film’s title. It is the sort of over-confidence that tends to get punished at the box office, particularly since Harmony‘s open-ended conclusion may leave audiences rather frustrated. It is also a hugely bland title, one that reads more like a parody of a film than the film itself. That sense of stereotype sadly extends to the film itself, which offers an overly familiar story with a range of stock-standard characters. Technically the film delivers varied dividends. The sound mix is a mess, with music occasionally drowning out the dialogue. Things are much stronger on the visual front, albeit with a heavy debt to the early Alex Proyas films The Crow and Dark City. A few poorly selected angles jar a little – mainly close-ups used where a middle shot would have made more sense – but as a debut feature it still manages to be fairly impressive. Despite a limited budget the visual effects are striking and effective. Sadly, and this is always where a film of this nature fails, the screenplay is absolutely terrible. Cliches and stereotypes abound, and the weirdly vague and generic nature of the story – actual details saved for a planned sequel perhaps – are frustrating. The film climaxes with an antagonist (Eamon Farren) being treated on a level of a Marvel super-villain without having actually done anything particularly evil or dangerous. There’s no proper structure to the plot; simply a messy first act that takes 90 minutes to play out. Some of the cast work gold out of straw. The late Jessica Falkholt is hugely engaging as the titular Harmony; it is an enormous tragedy that she died in a car crash this past January, as I suspect she had a great career ahead of her. Eamon Farren is delightfully unsettling as the gang leader Jimmy. Jacqueline McKenzie does the best she can with an oddly perfunctory role. Nobody really pulls off their American accents. As the awkward Mason, Jerome Meyer delivers a weirdly idiosyncratic performance. At first I thought he was playing some kind of disguised alien, then somebody with fairly pronounced autism, and ultimately wondered if it was simply weird direction or bad acting. When the film is good, it generates a lot of goodwill. When it’s bad – and it is absolutely bad much more often than it is good – it grates on the nerves. There is a potential to Harmony, and there is definitely a gap in the local market for films like this, but as it is presented on-screen this is not the film to fill the gap. Some viewers may find appeal here, particularly ardent fans of the genre or those wanting to see Falkholt’s final performance. For me it was maddeningly poor.